News round-up: Zoë watches The Jungle; Girlfriends DVD and Love Hurts in the US; new portrait – and much more! Here’s Zoë and her husband arriving at London’s Playhouse Theatre for the World Refugee Day performance of The Jungle on 20 June. They’re also pictured in Whatsonstage.com’s coverage of the event, as is Pearl Mackie, Zoe’s co-star from another recent theatrical hit, The Birthday Party. As The Jungle’s website explains, the audience is ‘transported into the world of the Calais refugee and migrant camp, where a community forged from necessity shares unimaginable stories of hope against all odds’. The first series of The Older Woman (1993) is being repeated on BBC Radio 4 Extra (keep an eye on the schedule, as dates and times vary). It stars Zoë alongside Martin Clunes and Toyah Willcox (whose website includes several great clippings about the show’s original broadcast). You can now watch Dan Poole and Giles Terera’s stunning Shakespeare documentary Muse of Fire (2013), which features insightful interviews with Zoë and numerous other well-known actors, via Vimeo On Demand. You can also enjoy Keeping the Castle, a 2013 documentary narrated by Zoë that was released on DVD in mid-June. Some stores suggest the DVD is Region Free and others that it’s Region 1, so please get in touch if you can confirm the format. ‘Viscount Crichton, son of the sixth Earl of Erne and heir to the historic family home of Crom Castle in County Fermanagh […] faces the ever-increasing challenge of keeping a castle despite growing bills,’ explains the BBC in its summary of the programme. 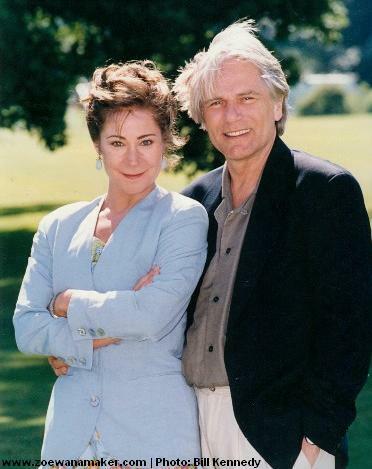 Look out for early 90s TV classic Love Hurts, starring Zoë and Adam Faith, on Acorn TV (the streaming service that showed Girlfriends in the US). Series one of the romantic drama will be available from 30 July. To the best of my knowledge, Love Hurts hasn’t been repeated in the US for over ten years. Acorn TV subscribers, you have a real treat in store! The portrait of Zoë by Terence McKenna that recently appeared in a London exhibition can now be viewed online, thanks to the artist. I’d say it really captures Zoe’s elfin qualities. What do you think?